When a fragrant box of smoked meat arrived on my doorstep thanks to Teet's Food Store, I didn't know where to begin. Sure, I had some wild ideas: grand taste experiments that would challenge my abilities as a chef and demonstrate the most extreme creativity. But in reality, it was a Thursday, I'd worked all day, and I needed to get dinner on the table fast. So I made a comfortable dish, a family favorite - carbonara - with a Cajun twist. 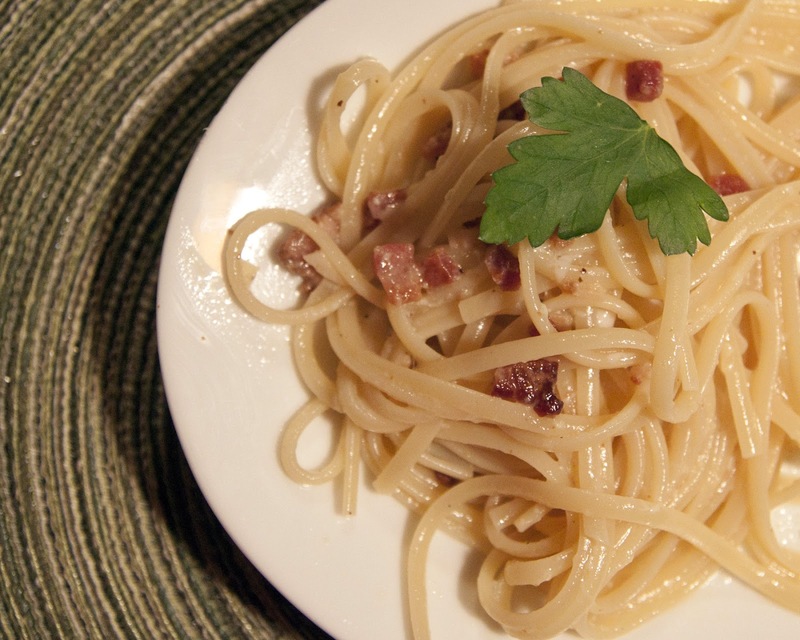 If you've never made carbonara, you're in for a treat. It's your favorite pasta, studded with crispy pork bits, in a creamy sauce made from just-barely-cooked egg. Carbo-loading has always been fun, but it just got better. Before you get started, do a little prep work: in a small bowl, whisk together the eggs, cheese, and Slap Ya Mama seasoning. Set aside. Set a large pot of water over high heat to boil. When it comes to a rolling boil, add the pasta and cook until just almost done. Meanwhile, heat the olive oil in a large saute pan over medium heat. Add the diced tasso and saute until slightly crispy and fat has begun to render. Add the garlic and turn the heat down to low. Drain the pasta and add it to the pan with the tasso and garlic. Toss for a moment so the flavors mingle, then take the pan off the heat. Whisking quickly, add the egg mixture to the pasta. Toss and stir constantly until the eggs have thickened into a creamy sauce. (If the eggs scramble instead, exhale and eat it anyway - it will be tasty). Garnish with black pepper and a little more cheese, then serve and enjoy.